J.K. Rowling once said, "If you don't like to read, you haven't found the right book." The "right book" and accompanying author might just happen to be at Trinity Preparatory School's Author Festival on February 8. 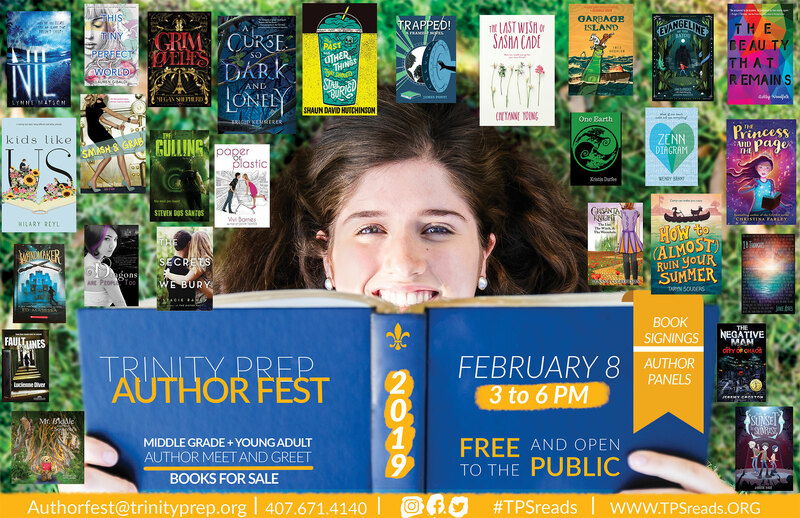 Trinity Prep's 4th annual Author Festival is a free, community-wide book and author event open to the public and hosted by the preparatory school in Winter Park, Fla. This year, nearly 30 well-known authors from the U.S. and Canada will be on hand to sign books, lead discussion panels and chat with young readers and aspiring writers. "I can't wait to be a part of the Trinity Prep Author Fest," said Brigid Kemmerer, an author featured at this year's event. "I love when schools and students and readers and writers come together to talk about books and storytelling." What also makes this event exciting is the Trinity Prep student involvement. Students will be leading all of the author panels and helping to coordinate the event's structure. They were charged with creating the questions to ask during the panel sessions, as well as handling the details surrounding the authors' schedules. "I'm very excited for Author Fest because so many Trinity students get the opportunity to meet their favorite authors and talk to them," said Trinity Prep freshman Leah Keefe. "I think it's so cool that we get to experience interactions with these authors that we probably wouldn't get at any other school." This is truly an author festival with the reader in mind. Event planners Reba Gordon, director of the Rich Library, and Georgia Parker, English and Literature teacher, have book signings scheduled, as well as multiple concurrent panels in which authors will discuss their writing process, the path to publication, and the importance of reading. The event takes place in the Rich Library on the campus of Winter Park's Trinity Preparatory School from 3 to 6 p.m. Friday, February 8. "The countdown is on," said author Kristin Durfee. "Hands down my favorite event of the year. Mark your calendars!" Last year over 300 people were in attendance. And, with even more authors participating this year, event planners are expecting an even better public turnout. Those interested can get more information at www.tpsreads.org.